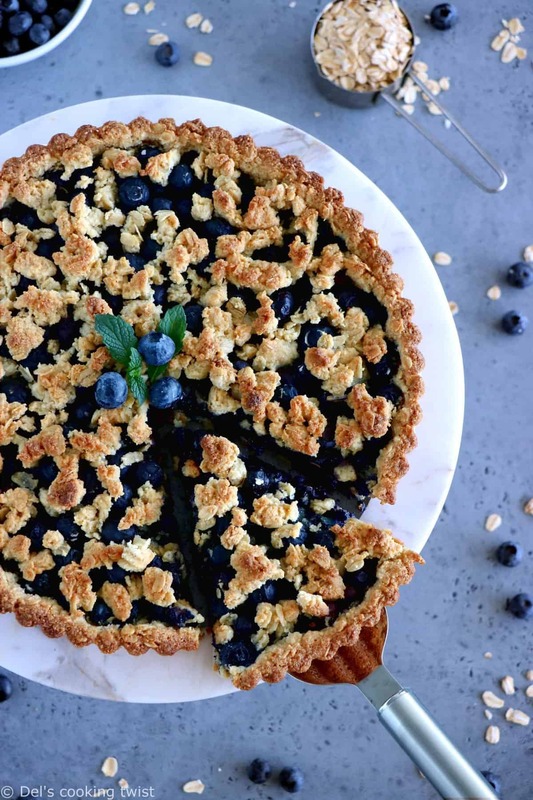 Crispy and juicy at the same time, this simple gluten-free blueberry pie will amaze your palate with its lovely oat crust and crisp on top. 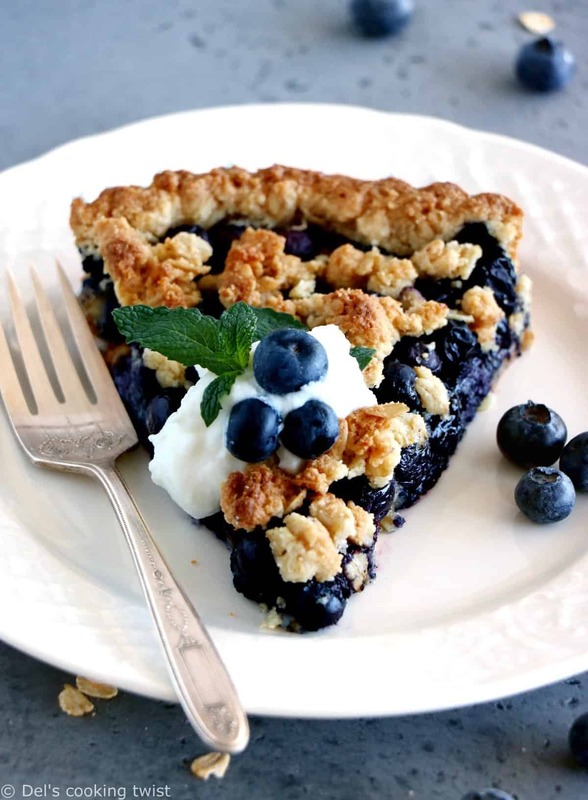 Blueberries are in season; let’s make the best out of them by preparing some delicious and juicy recipes. Blue or purple in color, sometimes small (in Europe) or almost giant (in the US and North America in general), these precious berries are sweet, nutritious, and loaded with health benefits, especially if you eat them fresh. Among others, blueberries have the highest antioxidant capacity of all commonly consumed fruits and vegetables; they reduce DNA damage, which may help protect against ageing and cancer; they may lower blood pressure, prevent heart disease, and help maintain brain function and improve memory… In order to get the most benefits, it’s preferable to eat them fresh while in season, even if you can luckily enjoy them thawed all year round. And if like me you like to enjoy all kind of berries together, I suggest you check my 20+ Very Berry Recipes. 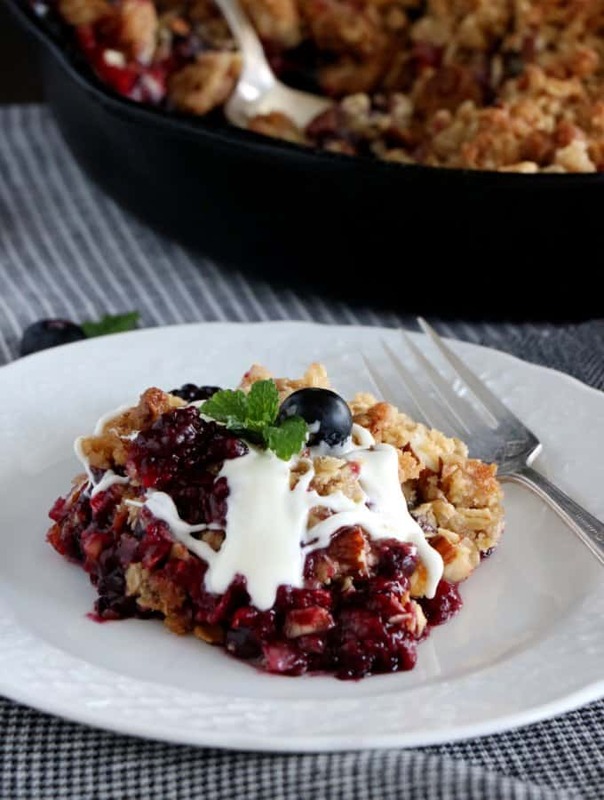 For most of the recipes listed, you can easily replace other berries with blueberries. 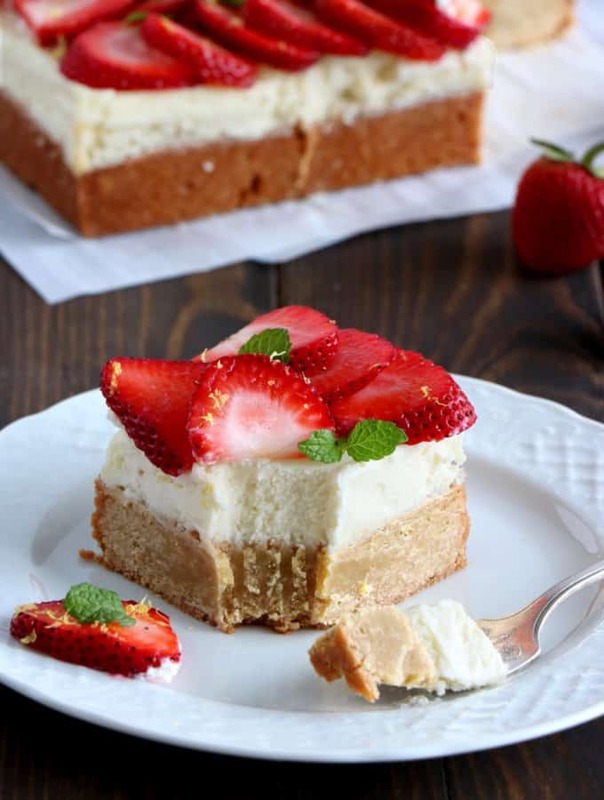 Be creative and feel free to contact me if you are unsure about any change you would like to make to an existing berry recipes; I’m always happy to help. 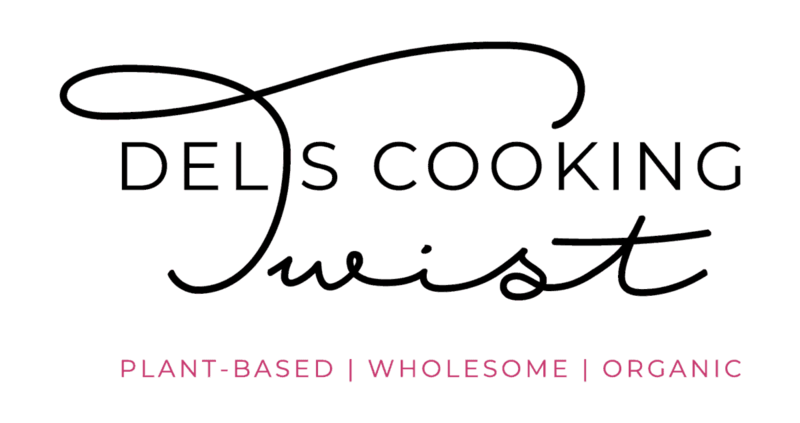 Last but not least, remember to tag #delscookingtwist when you try one or several of my recipes so I can see them too. 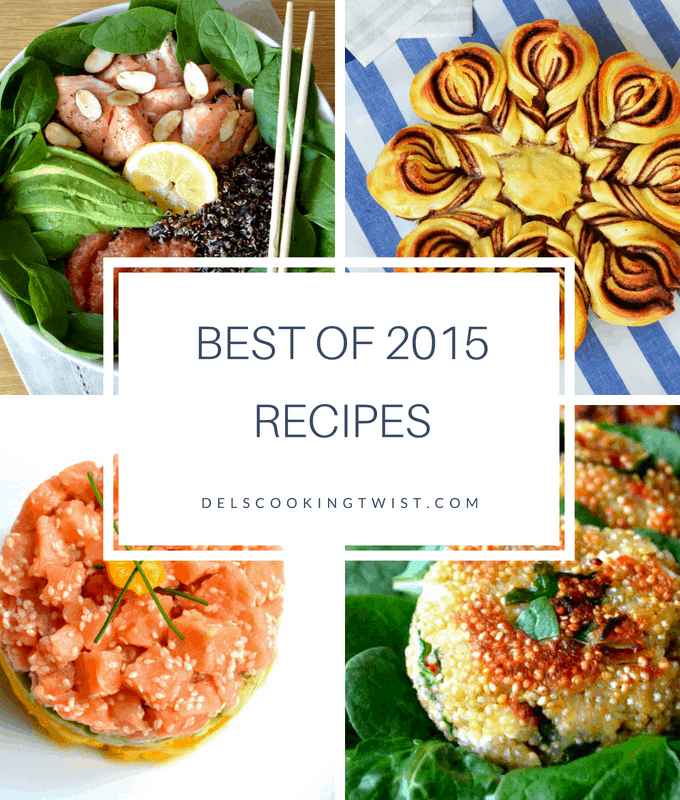 You can also share them on my Facebook group In the kitchen with Del’s cooking twist. 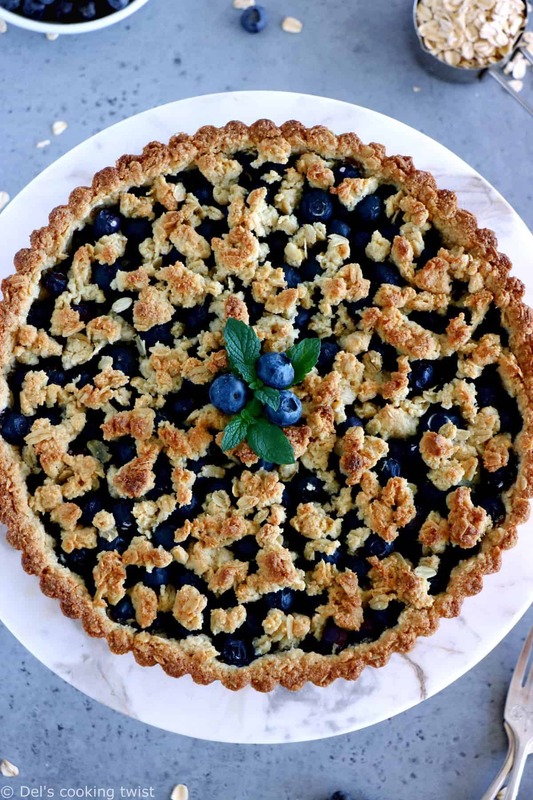 For this berry pie recipe, I prepared a simple blueberry filling that I wanted not too tart, not too sweet either. 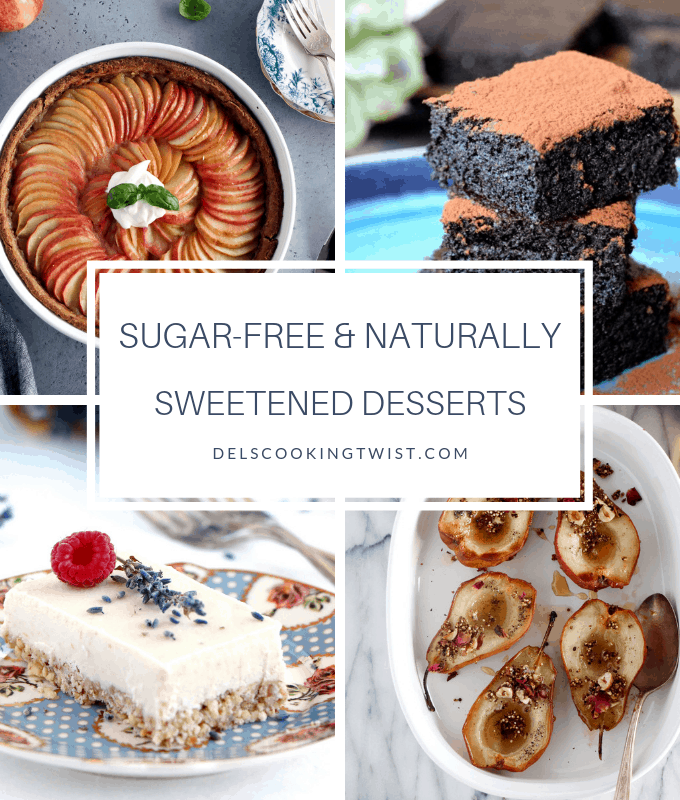 As a result, I used only one Tablespoon of sugar, a quantity you can adjust depending on your own tastes of course. 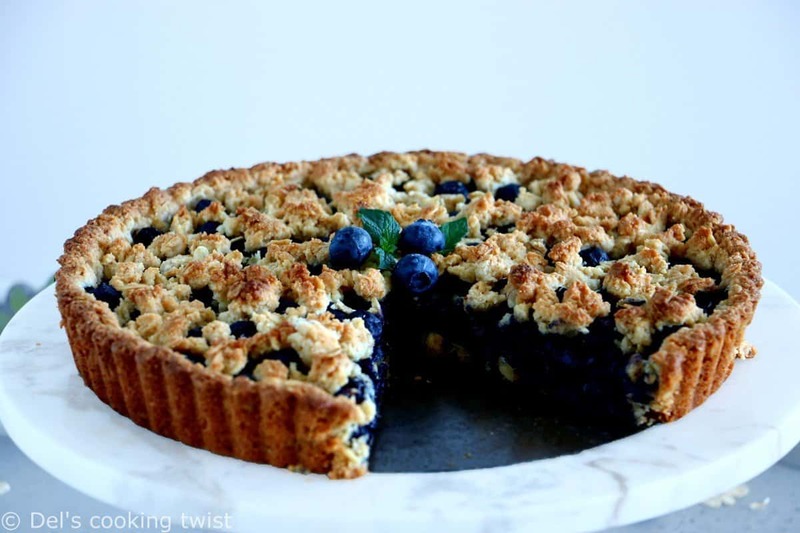 I then added lemon zest to enhance the blueberry flavors and bring some freshness to the whole filling. 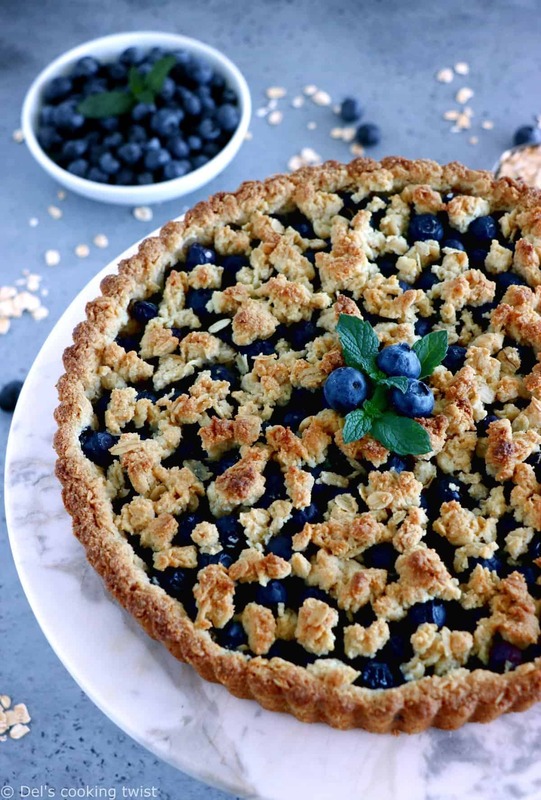 The use of corn starch is also very recommended as it will prevent the blueberry filling to soak the crust at the bottom. If you don’t have any, you can instead use a little bit of flour, it should do the trick too. 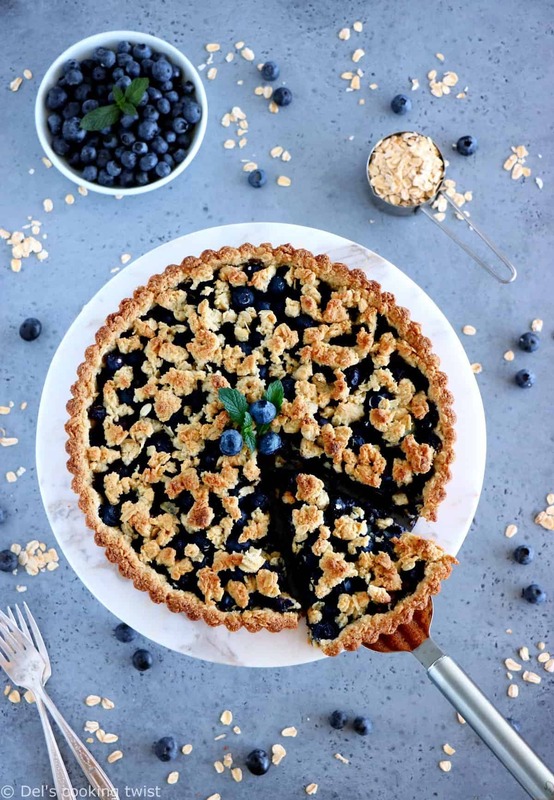 Now what makes this blueberry pie so special is of course the crust and crumble topping that are actually made out of the same dough – a 100% gluten-free dough. 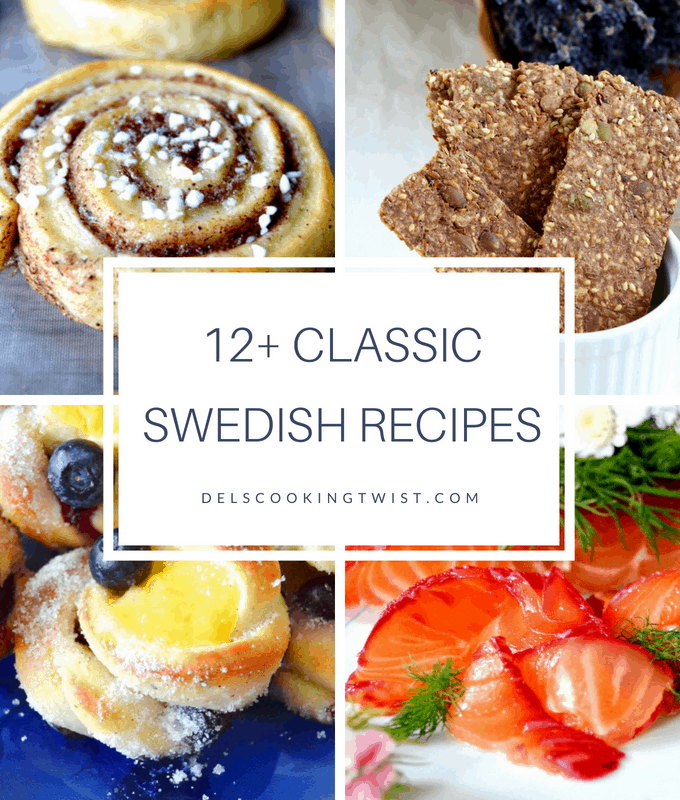 I once tried a similar crust in Sweden and found it absolutely marvelous, sweet, thin and crispy, and have hoped to prepare a similar one ever since. 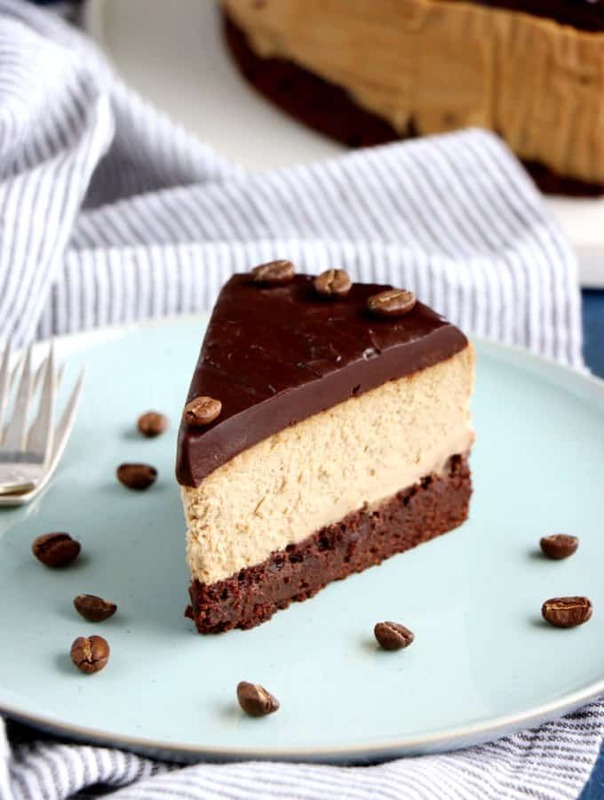 Sadly my friend who baked it never revealed the secret of the recipe she had from her grandmother but it didn’t discourage me if not the opposite encouraged me to find out by myself how to make my very own version. 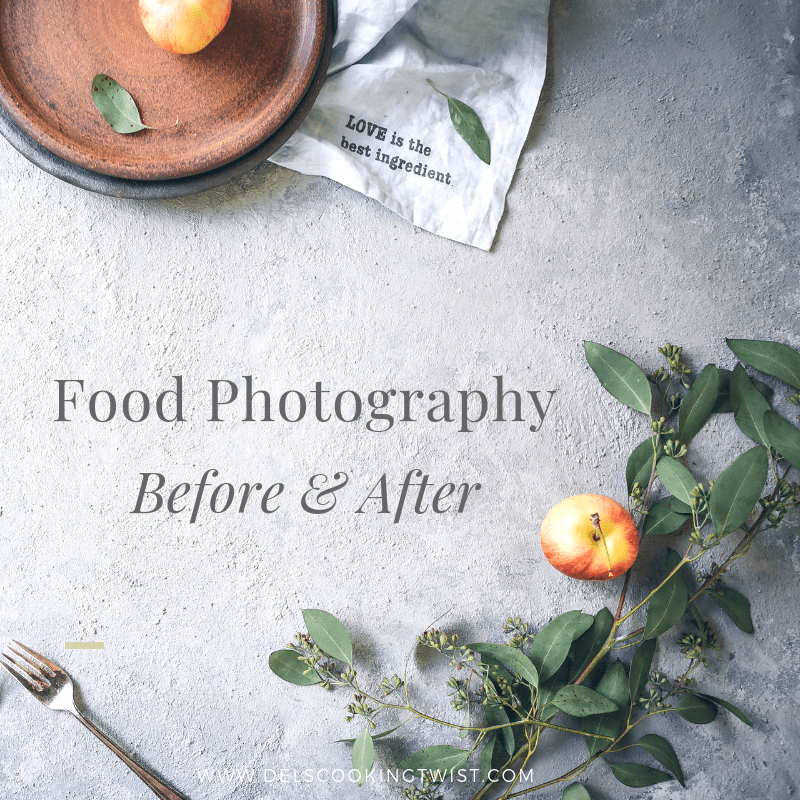 I have very good memory when it comes to food and various tastes I once tried and kind of knew already how I could make the magic happen. I found inspiration from various recipes, wondered for a second if I wanted to make it vegan and decided not to in the end. 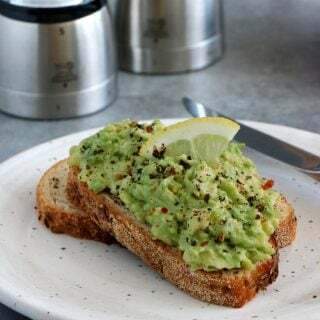 It is however still possible to make a vegan version by simply replacing butter with softened (not melted) coconut oil with the same proportions. As you know, I sometimes create vegan recipes myself but I am not vegan myself and wished for the buttery texture and taste of this crust. Don’t let this new crust recipe intimidate you; it’s actually pretty simple. Just mix all the ingredients together in a mixing bowl, keeping the softened butter for the end, and adding it progressively by hand. Note the use of baking powder in the crust, that will help the ingredients to stick together and prevent the dough from collapsing when you slice it. Once the dough is ready, pour into the bottom of a previously greased tart pan, reserving about half a cup for the top part. Press gently with your fingers so the crust fits the bottom and side of the pan, then pour the blueberry filling on top. Sprinkle the remaining dough on top of the crust, and bake for 40-45 minutes, keeping an eye close to the oven to make sure the crust doesn’t burn. If it turns too golden brown, cover with foil. 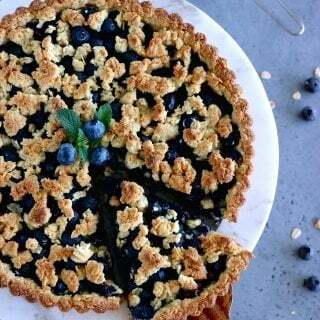 The tart is ready when the blueberry filling is bubbling. Enjoy with vanilla ice cream and fresh mint. Preheat the oven to 350°F (180°C) and lightly grease a 9-inch tart pan with a removable bottom. Set aside. 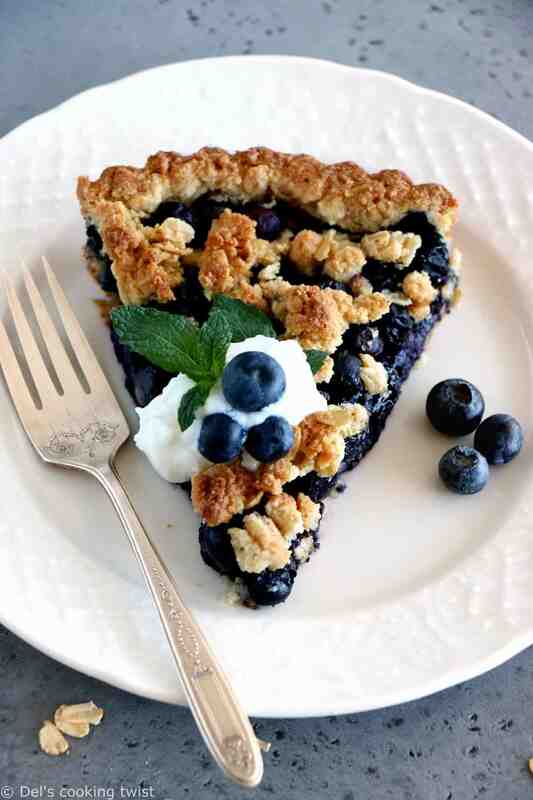 In a medium bowl, toss together blueberries, sugar, corn starch, and lemon zests until coated. Set aside. In a separate bowl, combine almond flour, oats, honey or maple syrup, baking powder, and salt. Add softened butter and use your fingers until coarse crumbs form and the mixture holds together when pressed. Add the remaining crumble and sprinkle evenly over the top of the berries. Comme elle me plait cette jolie tarte !!! ce qui nous donne beaucoup d inspirations bonne journée à toi. Oh merci beaucoup Corinne pour tes gentilles attentions qui me touchent beaucoup 🙂 Rien de grave de ton côté j’espère. Bises!